In honor of Valentine’s Day, we’re doing something we’ve never done before – we’re discounting our Organic Rack of Lamb by 20% until February 14. 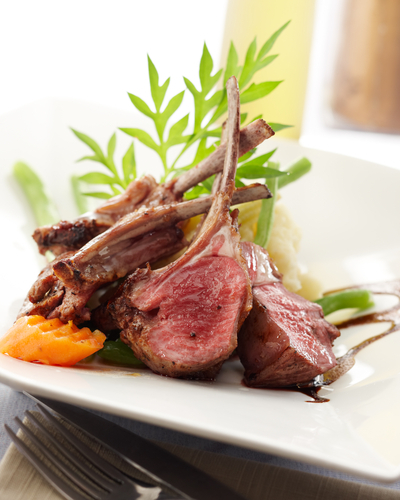 We love our rack of lamb – chefs, food writers and customers describe it as incredibly tender, succulent, and delicate. Try preparing it with one of my favorite recipes from Chris Kastner of CK’s Real Food here in Hailey – Rack of Lamb with Argentinian Chimichurri Sauce – it’s fantastic! Place your order now so you can treat your sweetheart to a delicious Valentine’s Day dinner with organic, grass-fed Lava Lake Lamb at a special price. We had a crazy windstorm at Lava Lake in October, along with some early snow. One of the old cottonwood trees in the yard at the main ranch was uprooted, which is a shame – we will all miss its shade next summer in this sagebrush desert where trees are few and far between. The fierce wind that uprooted our cottonwood also shook hundreds of apples from our two trees. They are old varieties, and one in particular is really tart and delicious. I look forward to those apples every year, and was obsessed with a need to pick them up off the ground and do something with them. So my daughters and I spent a day sitting under the trees in the thin fall sunshine, gleaning many pounds of apples to be made into pies and apple butter. Phoebe brought her horse out and he munched companiably while we talked and worked. Fiona wanted to know why we didn’t just feed them all to the chickens and horses, and I agreed that would have been sensible, and easier, but I was compelled to gather those apples and do something with them. As I considered this I realized it was my inner farmer speaking – some genetic programming coming from many generations of farmers in my family that just couldn’t stand to let those perfectly good apples go to waste. It’s the same impulse that makes a farmer save odd bits of metal and wood, scraps of leather and old nuts and bolts, saying (as my dad still does), “I might need that some day.” Farmers are the ultimate recyclers, composters, pack rats. It’s November now and the harvest season is drawing to a close. I hope you have a chance to celebrate your inner farmer, whether you live on a farm or in a high rise. Order the seasonal special at your favorite restaurant, make jam, pick herbs from your window box or save something you might have thrown away for some future use. Or just say a prayer of gratitude for the beauty and abundance the earth provides us every day. That’s your inner farmer speaking. This week we cooked up some new lamb sausages for breakfast – some of our customers prefer not to eat pork products, and asked if we could make sausages with non-pork casings (nearly all non-kosher sausages have pork casings). So we are trying lamb casings – they are much narrower, so these sausages look like a long breakfast link. They were delicious! They were great with scrambled eggs but would be good with other dishes too. I probably wouldn’t grill them because they are so narrow – I think they would cook too fast on a hot grill. But they are quick and easy on the stove top. You can find them on the website. Whatever sounds started your day, go out and make it a good one! 2 racks. That means two really special dinners – maybe a birthday dinner or an evening with special friends or clients. They will be wowed. And it’s one of the easiest cuts to prepare. 1 boneless leg. This covers an Easter or Passover feast or one nice barbeque for 10-12 people. The leftovers will provide another great meal for your family later in the week (look at our website and this blog for some good lamb leftover recipes). 8 loin chops. A classic, like the rack they are so quick and easy to prepare and everyone loves a tender juicy lamb chop. My husband and kids love chewing on the bones. These are a big treat at my house. minutes and after that they just slowly cook in your oven or slow cooker. The end result is the most tender, succulent lamb imaginable and the leftovers are fantastic. Our shanks are so big and meaty, this is enough for two meals for a family of 4. 4 packages of short ribs. These are the yummiest ribs I’ve ever had – so tender and juicy. We serve them as an appetizer when we are grilling and they disappear before your eyes. 4 sirloin roasts. These “petite” leg roasts are perfect for small families. Marinate and roast them as you would a leg, or cut them into strips for fajitas or stir fry. 1 boneless shoulder roast. This cut is fantastic prepared in a slow cooker or braised in the oven or, if cut up for stew or fajitas. 3 lbs. of ground lamb. This has to be my favorite thing to reach for in the freezer. It’s so easy to use ground lamb. Make lamb burgers stuffed with goat cheese, use it in a pasta sauce, or make our favorite lamb & wild rice meatballs. I never get enough of this. 2 lbs. of trimmed stew meat – perfect for classic lamb stew or curries. A whole lamb provides at least 20 delicious, healthy meals for a family of 4. At $459, that’s about $23/meal on average or $5.60/person! So seriously, order a whole lamb. It’s like a secret weapon in your freezer – ready to solve your dinner party problems or mid-week “what to cook for dinner” blues at a moment’s notice. You’ll save money, you’ll save time and trouble, and you’ll be making us really happy too!